So, If you are here reading this, we take it you have cruised around our website, checked out our tattoo galleries, read about us and our shop, and are now ready to get some ink of your own, right? Well, if you are wanting a custom designed tattoo, then you are in the right spot. We don't give out prices over the internet, phone, text message, e-mail, snail mail, FedEx, UPS, Skype, Facetime, Satellite Uplink, or Spy Device. We apologize if you are are a huge fan of one of those methods for your tattoo quotes, but we prefer to do it the old fashioned way, in person, with a handshake and a friendly greeting, before we talk prices. We chat about what you are wanting done, ideas, long term tattoo goals and other topics while we feel you out as a potential client. After we have agreed on a design and a price/payment arrangements, we can schedule you in for your chair time. We're not pulling a piece of flash, making a stencil, sticking it on ya, and turning and burning. 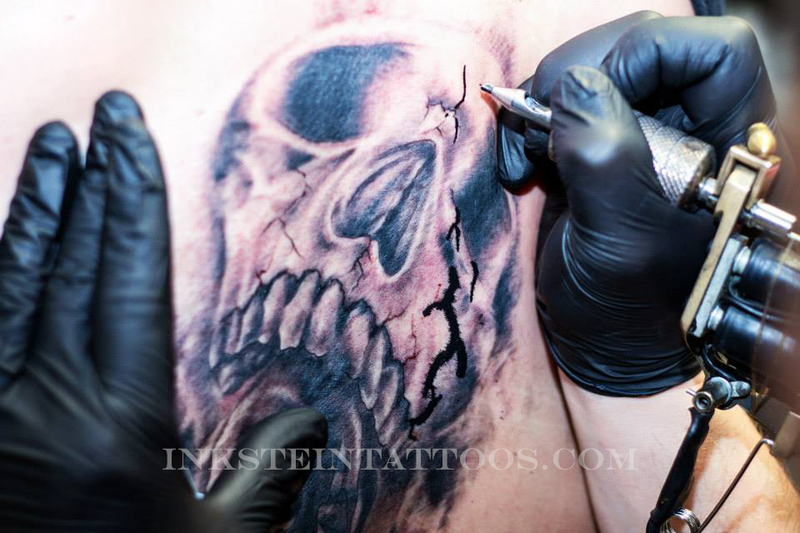 We do quality custom tattoo work, and value every one of our clients. *We do require a small deposit with all appointments.